Banner Stands - Repros Inc. Whenever and wherever you represent your brand in public, printed banners are the easiest way to make your message pop. And the value doesn’t end there, because your branding will live on in photos taken at your event and shared on social media. With a little planning, the right banner can be a long-term media investment for promoting your message. But after you put all that time and effort into planning the perfect banner, it’s just as important to choose the right equipment to display it. The right stand will either protect a permanent banner long-term or will be flexible enough to evolve with your messaging. There are three main categories of banner stand. Each one is ideal for different needs, so consider how you’ll use your banner and read on to find the right kind for you. One-year warranty on the stand and an exceptional spring. Compact form factor travels well and saves on shipping because six fit in a box instead of just four. Available extras include built-in lighting and quick change kits for swapping signage. You can supply your own artwork or use our team of graphic designers to customize your design. We also have the experience and flexibility to integrate with your advertising or branding agency. Open communication throughout the design and printing process means you get what you ask for, on time and on budget. 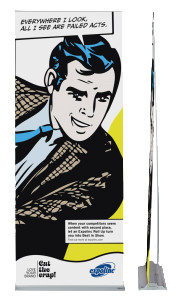 Banner Stands can be displayed at your office, customer locations or events. They pack up small and are very portable.